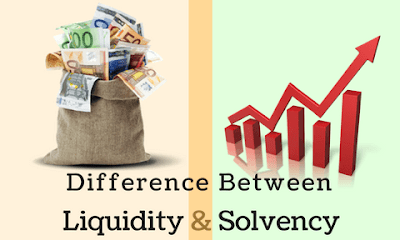 The word solvency is common nowadays because of many defaulters but the word liquidity you might or might not hear. But both are related to a finance while making an investment in a company. With help of this two-parameter investor will decide whether to invest or not. Both this helps to determine the goodwill of the company but are very different to each other. Liquidity covers the effectiveness of the firm's current liability to current assets. Liability is the firm's ability to meet their responsibilities in short run like one year. It determines the limit by which a business unit fulfil its financial commitments by using assets like stock, cash on hand, certificate of deposits, securities etc. The liquidity of the company directly affects the business because if it is not in a good position then there is a high chance that the company may default in future. So the liquidation position of the company helps to determine whether a company is secured or not. The word solvency means the potential of the business activities for the foreseeable future to expand and grow. It is the determinant of the company's capability to fulfil their long-term financial obligation which will due in payment. It measures assets of the company against its liabilities whether it is greater or not. It is shown on the balance sheet of the company and shows the soundness of an entity. Liquidity affects the day to day activities of the firm and affects the profit of the firm. It determines the firm's ability to run regular operations in the future. Liquidity means the ability of a firm to cover a firm’s day to day operations currently. It shows the firm’s capacity to run daily activities in time. Solvency means the firm’s ability to pay the dues which are going to occur in the future and this can be done only if the firm has enough business assets. Liquidity has short-term obligations as said it has to just cover day to day operations. Solvency has long-term obligations means it has to arrange the fund for the future dues. Liquidity has a low level of risk. Solvency has a higher level of risk. If the liquidity of company is weak it directly affects the creditworthiness. Solvency of a firm lead to a bankruptcy. Liquidity of the company is an easy tool to convert it into cash and reduce the short-term liabilities. Solvency of the company shows how it will sustain long in future to clear a long-term debt.